The next generation is watching us. What are we teaching them? 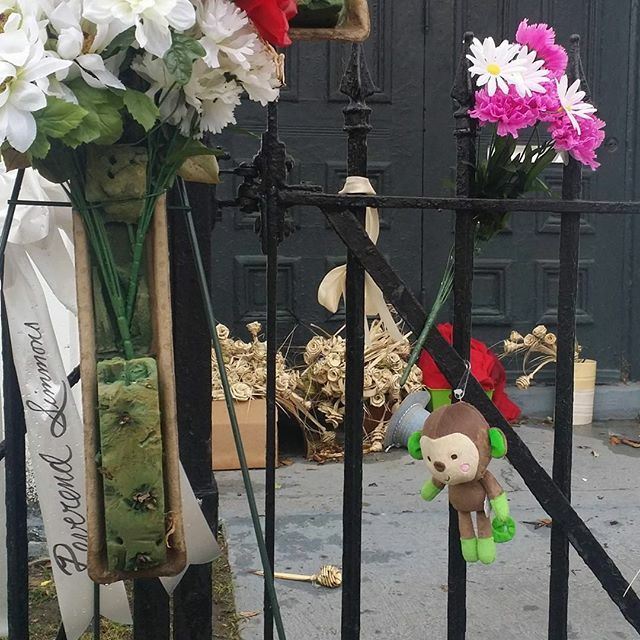 Our family made a pilgrimage to Mother Emanuel AME Zion Church in Charleston, SC today to pay our respects to those who lost their lives in the senseless, racist terrorist attack just two weeks ago.Among the dozens of flowers and other tributes that line the front gate, I saw this stuffed monkey. Some may say I’m overreacting, but where I come from, this is well known racist imagery. What I see is a monkey being lynched right in front of this house of worship where the whole world is mourning. Someone wanted to add insult to our injury. Someone spit on the graves of our murdered brothers and sisters here.I’m not sure how many people have noticed this, but as soon as I saw it, I understood the message. This brings me so much sadness and disappointment. In this place where so many people of all races are coming to honor the lives we lost here, some evil hearted soul used the opportunity to perpetuate the hatred. Happy Birthday, America. It is clear to me that we have a very long way to go. I got the news from www.BlackVoices.com on Twitter, but I had to go to the horse’s mouth to check it out. Sure enough, Duke calls former Maryland Lieutenant Governor Michael Steele “Obama Junior” and “a radical Black Racist”.Â He blasts Steele for his pro-affirmative action stance, his opposition to assault weapons and his opposition to the death penalty. I am glad these traitorous leaders of the Republican Party appointed this Black racist, affirmative action advocate to the head of the Republican party because this will lead to a huge revolt among the Republican base. As a former Republican official, I can tell you that millions of rank-and-file Republicans are mad as hell and arenâ€™t going to take it anymore! We will either take the Republican Party back over the next four years or we will say, â€œTo Hell With the Republican Party!â€ And we will take 90 percent of Republicans with us into a New Party that will take its current place!